With its unsurpassed speed and precision, KeWin multimedia is the perfect solution for retailers with medium to high ticket volumes. Swift detection, evaluation and further processing of the betting slips prevents queues - particularly at peak times. High-quality standard PC components with industry quality allow precise adjustment to specific customer requirements. If necessary, upgrading is possible in the event of technical further development at any time without additional development effort. This means maximum investment protection. 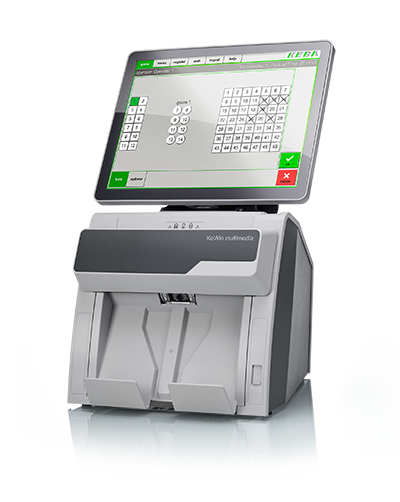 The KeWin multimedia lottery terminal has a new modern design and scores high points with its connections, which can be accessed from the front. This front-facing layout is unique and, in combination with an upward-pointing ventilation concept, simplifies integration in existing furnishings. Small lottery agencies in particular will benefit from the possibility of positioning the terminal in-between other objects as well as from the much smaller footprint measuring just 353 x 305 mm. The new multitouch customer display and the largely fanless and, thus, quiet operation are especially user friendly. 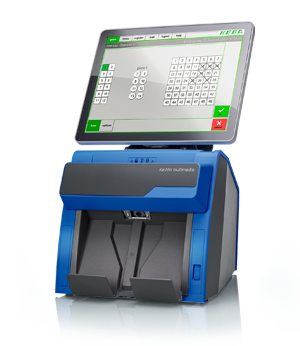 The technology of the compact scanner was developed by KEBA themselves. Ergonomic thought-out design which integrates every movement in the operating flow and supports the operation. Full-surface scanning and OCR/OMR evaluation allow flexible ticket format selection and quick introduction of new games. Moreover, KeWin multimedia functionality can be extended with numerous options. The front of the scanner and the colour of the terminal can be freely selected (RAL) to match lottery company corporate design. The KeWin multimedia integrates ergonomic operation with the harmonious design of the basic terminal and printer. These core units can be used separately or combined, thus permitting flexible system installation in line with the space available.